If you remember, we got our Christmas cards through them last year. I have also purchased their journals, which I love. They have a great line of back to school items that I wanted to share with you today. So, how would you like to win $50.00 to spend in their back to school department? Just check out their website and let me know here what you would like to win! Also, on Friday, Minted is launching new shaped birth announcements, so be sure to check those out! FUN giveaway! 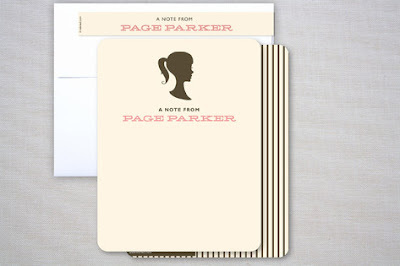 Love the "A Letter For You" stationary! I would definitely invest in some stationery for school...little notes to give to the kiddos when they do something great or reach a goal!! I would be very happy with the Love Builds art print!! I love all the baby anncmts... And the take time print!! I'd love to win the Forever Sunshine print! They have so much good stuff!! I love the notebook, initial notecards! Thanks for the chance to win! What a great giveaway! Thank you for hosting. There are too many wonderful things to choose from, but the one that caught my eye was their Je t'aime art print. I'd love it for our master bedroom! XO Laura D.
Such a great giveaway. I love all their stuff- it's so pretty. If I won, I would put it towards birth announcements. I can't imagine a lovelier way to announce my little pumpkin who is due in October! I love, love, love their journals. My son Loves to write and make up stories, so he would be so excited to have one for himself! I would get an art print for my gallery wall! Cute stuff! I could definitely go for the Love you so much art print. I love the "Courage" print! LOVE. The bright ideas one for both my girls- one would like to be a writer and the other an artist- great encouragement. Also love the book is a garden you carry in your pocket one- both love to read. These would make great back to school gifts! And then I'd hope there was a bit left over for me to get the be the change print- beautiful script and reminder for over the mantle. :) Thanks for sharing!! I'd like to win one of the journals. Great giveaway! I love the chalkboard journal and the personalized monogrammed stationary! I would love to have the book worm art print for my daughters! I'm due in January with #2 and am currently salivating over the variety of free form baby journals. And don't get me started on their beautiful Christmas photo cards!! 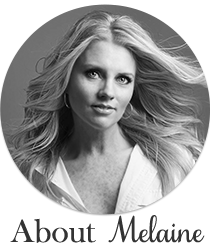 I would love to do birth announcements from Minted! I like the scallop ones. I fell madly in love with all of their back to school stuff. I received an email from them this weekend showing what they had. I wanted to order everything right away. I LOVE their website also and have ordered their journals as gifts including having one for myself. I love all of the journals! Especially love the Back to School Journal. I encourage my children to keep gratitude journals so that they learn to appreciate all the blessings they have in their lives. A personalized journal would be fun, but I think I would use my credit for some holiday cards with pictures of the kids. I've gotten so many cute cards over the past couple years and I've been sending the traditional old cards I purchased after Christmas. I'd love to send some that were personalized and come into this century. I adore the Cloud Nine Baptism invitation.... Very classy and perfect for our little man's Christening!!! I love the "grad watercolor words journals" and most everything else on their site!!!! Would love to win, too!! The chalkboard dreams journals..I think each of my kids would love that! I would love them to document all their dreams, goals, where they want to go to college and what they are going to "be"..we talk about these things and even though it changes I would love for them to be able to look back at them in this AMAZING journal. pretty much love it all, my girls are big into journals right now, and also would love a print for their room. Such fun stuff!!! I'd love some personalized stationery for my kids, so we can keep the tradition of the hand written thank you note alive!! I love the 'you are my sunshine' art print and the 'wisdom' art print. So many cute designs to choose from! 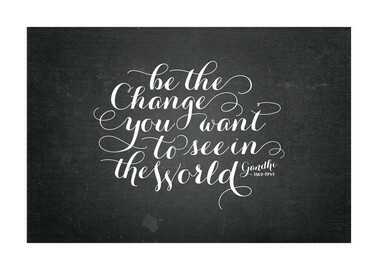 In a heart beat I would order the "Be the Change" that is my very favorite quote! Ooo... I'm not sure what I like most. But I adore the stationary, the journals, and business cards. I love the chalk board journal in your post. I could find several journals I know my kids would love too. It would have to be the journals...love these for my crew! The chalkboard dreams journals, little letters photo stationary and vintage silhouette stationary are all super cute! Name 1favorite,,,,are you kidding me? I love the vintage abc journal, the uou are my sunshine print...I could go on. Please pick me! 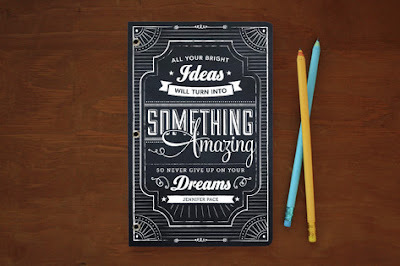 I love the vintage silhouette journal, but since I am a chalkboard freak, I would pick the Chalkboard Dreams Journal. The Chalkboard Dream Journal is my favorite but all the journals are fab. I'm loving the Dana Tanamachi journal! Pick me! So fun!! I love the journals. And the art prints! I would lvoe to have a stack of their delightful journals at my fingertips! I use notebooks a lot and those would be just so much fun! 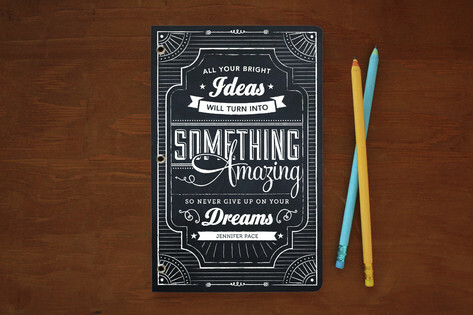 I LOVE Minted and would love the Chalkboard Dreams Journal as well. They are my go-to for Christmas cards with their cute designs! i absolutely love Minted! such darling things! i love "love you so much" prints! such darling reminders! 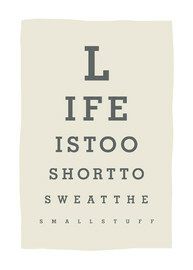 I like Life is to short to sweat the small stuff. LOVE the journals - I'd get one for each of my 3 kiddos!!! I would love some business cards! So cute. I love the journals, especially the wood-type "Put it in Print". Great for my son who is studying graphic design! love the States and Capitals prints! The new rounded birth announcements! I love the Book Love and ABC Friends prints! These were nice invites, I liked the fact that they were simple yet elegant. A cool feature would be to get them embossed or even laminated.